Many people have issues with the alignment of their smile but are concerned about how metal braces will make them look. Invisalign® clear braces provide a modern approach for correcting orthodontic issues that also takes into consideration your overall appearance. Drs. Adam and Theodore Lublin are premier Invisalign® dentists in Brooklyn and have been improving smiles for over 10 years. The entire team at Lublin Dental Center is ready to help you achieve the smile you have always wanted. Invisalign® is designed as a set of clear, plastic aligners that gradually shift teeth into their proper place. Anywhere from five to twenty-nine clear aligners are created, which are typically worn for two weeks at a time. 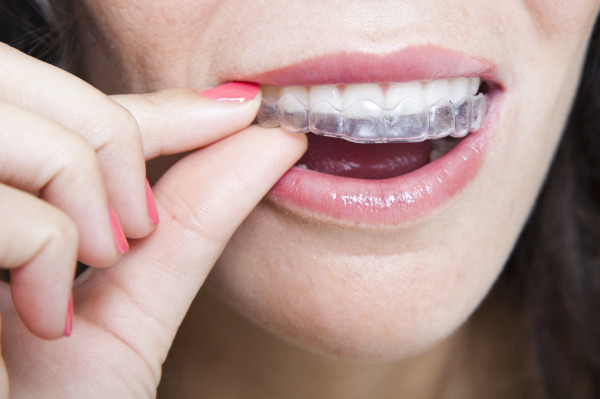 Invisalign® wearers can usually begin to see results within twelve months, although it depends on each specific case. The best part is that each aligner is virtually invisible, meaning that patients can correct misaligned teeth, bite issues, and unattractive gaps without anyone noticing. Traditional metal braces are an excellent way to straighten teeth, and may even be a better option than Invisalign® for some patients. However, Invisalign® is more aesthetically appealing, and along with being a discreet straightening method, Invisalign® retainers are removable, which allows for proper oral hygiene and dental care. Patients can eat and drink with no food restrictions as well as brush and floss without having to maneuver around metal brackets and wires. Once it has been decided that Invisalign® is right for you, Dr. Lublin will perform a dental exam, take x-rays, and fill any existing cavities. Afterwards, impressions will be taken of your teeth and sent to an Invisalign® laboratory. The Invisalign® laboratory will send back images of your mouth along with virtual time-lapse photographs depicting how your smile will evolve using Invisalign®. The laboratory will also create customized aligners that ensure your comfort. For best results, you should wear your Invisalign® retainers for twenty-two hours per day – only removing the aligners for brushing, flossing, eating, or receiving a dental cleaning. Invisalign® has been improving smiles for many years and our dentists look forward to discussing how Invisalign® can benefit your smile. A primary concern for patients looking to straighten their teeth is the impact of metal on their smile. Metal braces can be discouraging, but with Invisalign®, patients no longer need to feel self-conscious. For more information about the cost of Invisalign® or to find out whether Invisalign® is right for you, contact Lublin Dental Center in Brooklyn today!